Groups like Syrian Observatory for Human Rights and the White Helmets have successfully convinced large swaths of the Western public that they are independent, fair and accurate, even though the sources of their funding betray conflicts of interest and ulterior motives. conflict, has received significant funding from the United Kingdom’s Foreign Office, according to information obtained by British journalist Peter Hitchens. Hitchens, writing at the Daily Mail, reported that the country’s Foreign Office, overseen by Foreign Secretary Boris Johnson, had confirmed that it had provided SOHR with £194,769.60 (~$262,545) for “communications equipment and cameras.” That considerable sum had not been previously disclosed by SOHR and has brought the group’s long-standing claim to be an independent body under scrutiny. The amount of money provided by the U.K. government to the group is astounding, especially considering that the group consists of a single person — its director, Ossam Suleiman, who often operates under the pseudonym Rami Abdul Rahman (pictured) and currently lives in Coventry, England. Furthermore, SOHR’s single employee works only part-time for the organization, as his main business is running a clothing store in the city where he resides in the U.K., while his “network” in Syria consists of four people – not the 230 that he has suggested in the past. Given that the sum given to SOHR was enough to buy over 500 high-quality cameras and their associated accessories, it is hard to conceive of how one man working part-time, and who hasn’t even been to Syria since the year 2000, was able to make use of such equipment. While Hitchens’ assertion that SOHR has received funding from the U.K. government – which has long sought to push Syrian President Bashar al-Assad from power – is new, the information is not altogether unsurprising. 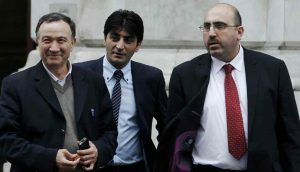 Indeed, Suleiman has been questioned about his neutrality and connection to the U.K. government before, as CNN previously reported that he was part of a delegation of Syrian opposition officials who met with then-U.K. Foreign Secretary William Hague in 2011. That year, Suleiman had also told Reuters that he would return to Syria only “when Bashar al-Assad goes,” suggesting that Suleiman shares an interest with the U.K. government in seeing regime change in Syria. Prior to Hitchen’s revelation of SOHR’s receipt of foreign funds, the finances of the organization were largely a mystery. Previously, Suleiman had told reporters that he received funds from a “European human-rights group,” but would not specify the name of the group. He has also claimed to have received around $141,000 annually since 2012 in support of his work. 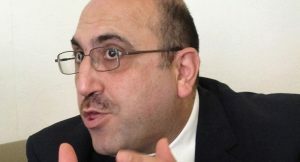 However, Suleiman noted that because “we’re in a state of war, it’s difficult to be transparent,” suggesting that publicly acknowledging the group’s funding is hindered by the fact that Syria – where of course Suleiman doesn’t live – is in a state of war. A bouquet of bogus “humanitarian” groups? during the battle for Aleppo and, more recently, in providing video footage of an alleged chemical weapons attack in Douma that is widely believed to have been staged. 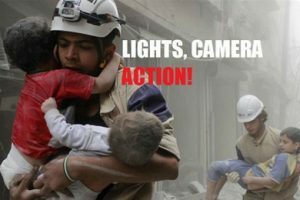 Like SOHR, the White Helmets have been treated as independent and trustworthy by many Western media outlets, which have lavished the group with unambiguously positive coverage and even helped it to win an Academy award. However, absent from positive coverage of the White Helmets has been the group’s links to terrorist groups like al-Qaeda, their doctoring of footage, their role in executing civilians, and their use of children – both dead and alive – as props for producing pro-intervention propaganda. Groups like SOHR and the White Helmets, over the seven long years of the Syrian conflict, have successfully convinced large swaths of the Western public that they are independent, fair and accurate, even though the sources of their funding betray conflicts of interest and ulterior motives. Now SOHR, like the White Helmets before it, has been shown to be yet another foreign-funded organization providing the spin for the “humanitarian interventions” led by the U.S., the U.K., and their allies that seeks to disguise geopolitically motivated regime change as “saving” people from a non-compliant government.